Tens of thousands of yogis visit YogaTrail everyday, looking for yoga events near them, or planning their next yoga holiday. Here are some tips to help you get the most from posting your event on YogaTrail. Yogis will want to know at a glance what your event offers, and long event names are confusing. Including as much information as you can in the event name is not always useful! 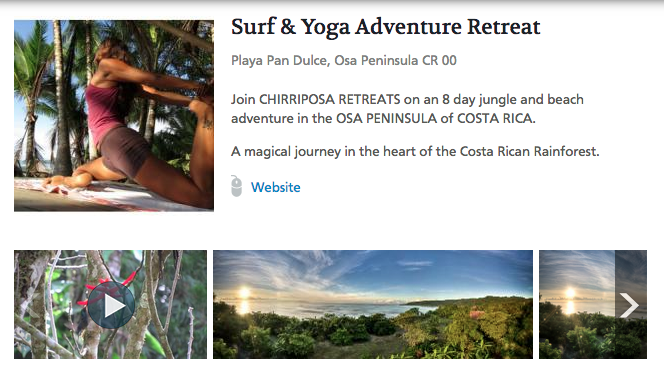 A long event name will also get cut off or look very unattractive in certain places (like in the YogaTrail newsletters). Remember, you don't need to include the event dates, the cost, the teachers, or the location in your event name. These are shown nicely already on your event 'snippet' and in search results. A picture is worth a thousand words, and your event thumbnail is what will make people click and visit your event details. Choose a photo with an adequate resolution (at least 200x200px, or about 100 kB) that's got a 'wow factor'! If you have an event flyer with lots of text on it, you will probably NOT use that one as your event thumbnail (the text will appear small, be cut off, and be impossible to read). When you create your event, you can also add many more images on the 'Media' tab. These will appear on the picture gallery on your event page and will give your potential clients an impression about the experience. Make sure to add beautiful images here too! When somebody clicks on your event preview, it's because they want to learn more about what you're offering. So provide that! The best way to loose a potential client is to add only a link to your website but very little actual information on the event page. Think about it: would you click to find out more? Luckily that's easy to fix: include information that gets people excited! Your teachers are an integral part of your event, and who is teaching is what many people want to know before deciding to take part. All your event teachers will be listed on the sidebar of your event page. Adding your teachers to your event also gives your event extra visibility (your event will rank higher in the local list of yoga events). Once you've created your event on YogaTrail, all your followers will get automatically notified in their newsfeed, in their weekly newsletters, and through the YogaTrail mobile app. So having a community of followers works wonders already. Of course sharing your event with your people on social media also plays an important part. You'll find 'share' buttons right on your event profile - use them! YogaTrail can alsopromote your event for you. If you'd like a little (or a lot) of extra visibility and you want to make sure that local yogis (or people around the world) will hear about your upcoming event, we can deliver a cost effective marketing package that's easy (because we do all the work! ).